‘Living Flame’ gas fire inserts suitable for Class 1 and 2 flues for the majority of our listed Carron cast iron Victorian fireplaces and fire baskets where stated. 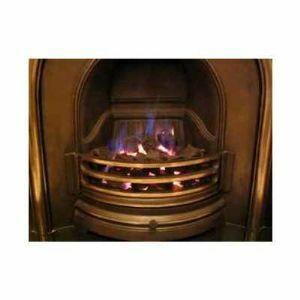 Carron gas fire inserts are designed as decorative living flame fires and are approximately 60% efficient (output approx. 3.5kW). During cold summer nights, the heat is sufficient to take the chill off the room, whilst during the winter, the gas fires will work alongside your central heating to add a boost of heat to the room. All gas inserts include coals and full instructions as required by your ‘Gas Safe’ registered fitter. When ordering a fireplace and gas insert together, we will supply the relevant gas fire to fit. Please choose between ‘manual’ or ‘remote control’ gas fires. We are unable to make gas inserts in bespoke sizes to fit other makes or original Victorian fireplaces.